A place with a lot of history, not all of it nice. Nice work! It creates a story in itself! I love that about some of the Art work! I know what "time out" means in America. When you're bad you have to sit in a corner, time out, until your mam says you can leave? Yeah. I can see why this could be a little creepy and maybe even a little scary, like a ghost story. The ghost comes back and gets people by going, "Time out for you now." Ouch. I like how you modeled the floor and the one plant growing out of it. this is very incredible. i was thinking this was a place that had aged over time - you had photographed maybe years later - done photo manip. but realize now this is fully rendered [if this is the correct terminology]. it's quite moving. This reminds of an area in Half Life 2. Really awesome, I thought it was a photo. You certainly have a talent. man thought it was a picture. somethings not quite right, and i love it. I think the story behind it is isolation. I never had Time Out when I was young, it was only an American thing, so I think that's why people don't get it. Although shouldn't the ''time out'' are be away from the door? That is the most busiest and noisiest place in the room! Just a thought. Lovely photo with deep meaning! This is beautiful. It's like it's haunted yet heavenly. I love this. Nice, I find the rocking chair facing the corner intriguing though. Sometimes, when children are in trouble, they get put into "time out", which is usually a quiet spot with no distractions where they can reflect on what they did wrong. I wanna know it's story! Congrats on the DD! You did great! Wow - A DD today!! I love this piece, and I always felt like it kind of got overlooked. Not anymore! Thanks WillowXD, and thanks everyone else too! Thought this might be an HDR shot. Then I saw the description. Nice work. OMG! At first I thought this was a photo and when I started reading the comments I was pretty damn shocked... If this really is a drawing - WOW! Excellent job on the light and shadow. Not bad but you forgot to render the roof... Silly you! Anyone else reminded of that house in Half Life 2 when they see this? You know, the one on the beach where you look through the binoculars and see gman... yea, that's what I thought when I saw this. Awesome pic by the way! ... holy crap I actually had to look at the genre to see that this is not a photo...far out. Nice one! Same, that was the first thing I thought of when I saw the thumbnail. Great render. Great! addin' broken glass to it would also be nice! 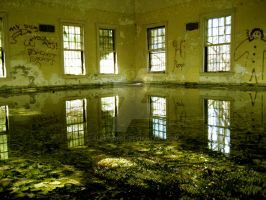 there are things that i think you could do to make it an even stronger piece, for example, some moss, broken windows, leaves all over the floor, and maybe you could even use particles to simulate those very tiny bugs and dust that are all over the place once you enter a forest or anywhere near it. Also, I think that the wood at the top looks new, the only real damage i see there is that it's broken, the walls at the top could have some leaking or anything that would give a darker color between the wall itself and where the wood is in contact with it, same thing for the windows. In the descreiption you say it's a place with a lot of history, but in an overall it looks more like the place was destroyed a few weeks ago. it still looks great though, you have a very good potential, i hope that what i had to say ever helps you on your next works! congrats! Fantastic realism, and I can feel that ambience despite the sunlight. did you apply materials in vue or in sketchup? looks great. I created the building and the floor planks in sketchup. Everything was textured in Vue. does sketchup have that wood? All the textures are mine, I only made the models in Sketchup. I render very high res, so I tend to make all my own textures so they're big enough. What fantastic realism, I would almost mistake this for a photo. Impressive work. The floor boards in the sunlight in front look great! I wont go into detail here but if you want, I could give you a full critique. I can see how "Damaged" has influenced you. Thank you for showing me this though. It feels amazing to know I have influenced someone so greatly as to make a whole new piece of art. Keep practicing, if you don't have a job in CG or VFX yet, I am sure you will soon.